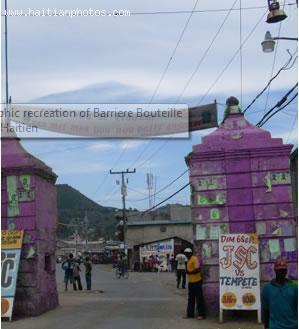 Barriere Bouteille or the three Booths at southern entrance of Cap-Haitian were found painted in pink which is the official color of the government of Michel Martelly. Will we see soon a new and improved pink Citadelle Laferrière? while we are at it, why not the Sans Souci Palace? According to some witnesses, they woke up one day and saw the three booths of Barriere Bouteille painted in pink with no explanation what so ever. Moun Okap Kote nou Ye! According to the Institute for the Protection of National Heritage (ISPAN), the three booths at the entrance of the Haitian second city of Cap-Haitian were last rebuilt under the government of Paul Eugène Magloire. They are located in the neighborhood of Barriere Bouteille. These booths made of heavy bricks and natural cement were strategically placed at the entrance of Cap-Haitian to allow the National Army to control the ins and outs of the city. They have become to represent a symbol for the city and since 1995 has been classified as a national heritage and history of Haiti. Barriere Bouteuille or the Three Booths are the first thing visitors see when entering the city of Cap-Haitian. Since 1995 the city of Cap-Haitian is classified as a national heritage of Haiti. Tout bagay an roz an Haiti. Kit Manje yap bay yo an Roz. Haiti Is Open for Bussiness. I think this is the job of the opposition. Why would the government do something like this because they know it would not be taken well by the public. I see the hands of Moise Jean Charles and his footprint all over this action. This is going too far. The government is at the bottom of all that. This government is really not looking for peace. Will we keep these things to take place. The Haitians radios are not talking.